Recently we’ve had a number of patients with similar complaints- noisy neighbours, or a snoring partner, that keep them from getting a good night’s sleep. 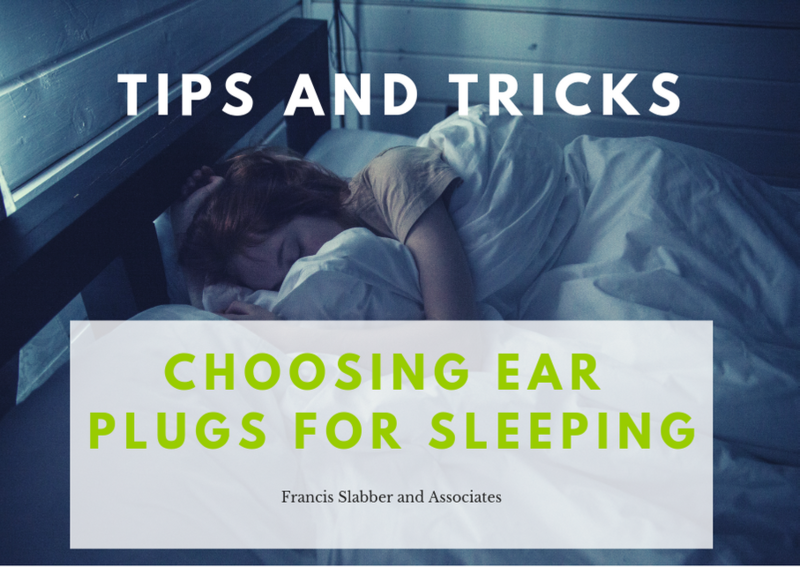 We all know how important it is to get quality sleep, and if a noise in your environment is keeping you awake, ear plugs can be a good option. But with all the options out there, it can be tricky to know which kind to purchase, and what to expect. When we are talking about ear plugs for hearing protection, fit is the most important factor. We want the ear to be protected from the loud sound going in. When it comes to plugs for quality sleep, however, we want to reduce sound but focus on comfort. No ear plug is going to be able to completely block out all sound- our skull bones also conduct sound so if it’s loud enough, you will hear it, even with very well fitting plugs. It’s important to be aware that sleep plugs will reduce sound, not eliminate it completely. When it comes to sleep plugs there are a few options that can be purchased directly. The most commonly used for sleep are foam plugs. These generally enter the ear and expand to fit, so they are really comfortable. They don’t provide all that much noise reduction, because some sound can still travel through the foam, but for some just a little less sound is enough to allow them to nod off. If you’re using foam sleeping plugs, it’s vital to remember that they are porous and therefore a comfortable home for bacteria and difficult to clean. Foam plugs should be replaced regularly to prevent putting the ears at risk for infection- in fact, most of them are actually designed to be single use. Another ‘over the counter’ option are mouldable silicon or wax plugs. These are often used for swimming, as they can be shaped to fully close the ear. They are not as comfortable as the foam plugs, and although they give more sound protection than foam, it’s not always possible to get a perfect fit, which means you don’t have as much control over how much sound is entering the ear. If shop-bought plugs just aren’t comfortable for you, or you would like to reduce more sound, you can have custom sleep plugs made out of soft silicon. These are built for your ears, so they should always be as comfortable as possible and give an accurate fit for the ear. These are more expensive, because they are unique to the shape of your ears, but they last longer than the other kinds of plugs. Remember, however, that even with custom-made plugs, some sound will still reach the inner ear via bone conduction, so don’t expect complete silence. Impressions for custom sleep plugs are made at an audiologist, who can have them made up for you. For those that need more noise reduction than ear plugs can provide, we recommend looking at noise cancelling headphones. There are some very high end products that will reduce sound and still fit comfortably in the ear, but they are expensive and can be difficult to find. Most noise reducing headphones are supra-aural- meaning they are worn over the ears inside of inside them, which makes them less comfortable for sleeping. If the noise is coming from outside your house or room, consider acoustic modifications in your bedroom- thicker curtains, closed windows, and moving the bed away from the peripheral wall, can all help to make external noise less invasive when trying to sleep. It can also help to introduce a soft sound into the room, such as a fan or radio, which can help to ‘mask’ the sound from outside and distract the brain away from the disturbing noise. For more information about plugs, comment below or contact us.